Shelly's funeral took place on Wendsday, December 9th, 1998, at Temple Beth Emeth in Ann Arbor, Michigan. Following are audio-clips and text files of the eulogies and prayers said at the funeral. If you don't have RealAudio or RealPlayer installed on your machine, you can download this plug-in free from the RealPlayer website. Cantor Annie Rose singing the Hebrew Prayer Esa Enai El He-Harim. Rabbi Robert Levy of Temple Beth Emeth. Dee Taylor - Shelly's first grade teacher for general studies. Aron Kaufman - Shelly's first and second grade teacher for Hebrew and Judaic studies. Dr.Eileen Mollen - Shelly's therapist, Chief of Pediatric Psychology at the University of Michigan Medical Center. Sheila Morris - Child Life worker at the Pediatric Oncology clinic, University of Michigan Medical Center. Susie Weber - Shelly's nurse at the Pediatric Oncology clinic, University of Michigan Medical Center. Rabbi Elimelech Goldberg of Chai Lifeline. Emily Eisbruch transcribed the eulogies. Thank you, Emily. Shelly's final resting place is ArborCrest cemerery, on Glazer Way in Ann Arbor. 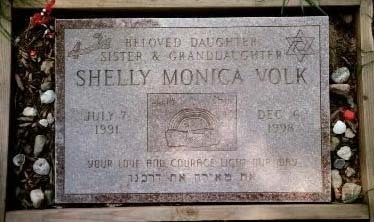 Above is a photo of Shelly's headstone. The epitaph reads: " Your love and Courage Light our Way". The inscriptions of the bird and the unicorn are made out of Shelly's artwork.